These are only few tips to help the undecided ones. I think there is no wrong choice; what matters is to know which side of your amazing personality you want to accentuate. Our mission here is to help you find the frame that will give you this little « je ne sais quoi ». And for that, we need to know your face shape. (In case it's difficult for you to determine your face shape, you can draw it by following the outline of your face on a picture of you). 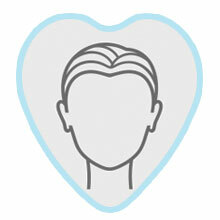 Oval: An oval face shape means you have balanced proportions and high cheekbones. It is what we call a Jackpot in matter of Binocles, it's a fit-all-frames type of face. Then all shapes of frames suit you; So please, help yourself. 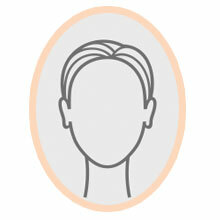 Square: A square face shape means you have a broad forehead, a strong horizontal jaw line and a squared chin. In this case, my advice is to soften your features with rounder frames. (Oval, round, CatEye frame shapes). Also, coloured frames will bring attention away from the square shape (try opposite colors of your hair). 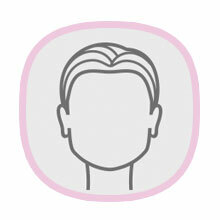 Round: A round face shape means your cheeks are full and your chin rounded (your face has very few angles). In this case, my recommendation is to sharpen your features with frames that work to add angles (rectangular, squared, geometric frames). 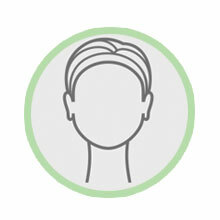 The more round your face is, the more angular your frame needs to be. 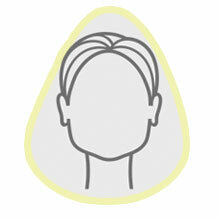 Base Down Triangle: A base down triangle face shape or what I call a rain-dropped shaped face means you have full cheeks, prominent chin and a slightly narrower forehead. In this case, we will try to bring attention to the upper portion of the frame (which can be larger or more detailing). Try edgy and angular frames; oversized wayfarers or horn shaped ones can suit you well.